Catesby, Mark. The Natural History of Carolina, Florida, and the Bahama Islands. v. 1, ed. 1. pl. 19. Digitized by Smithsonian Libraries. http://www.biodiversitylibrary.org/page/40753174. 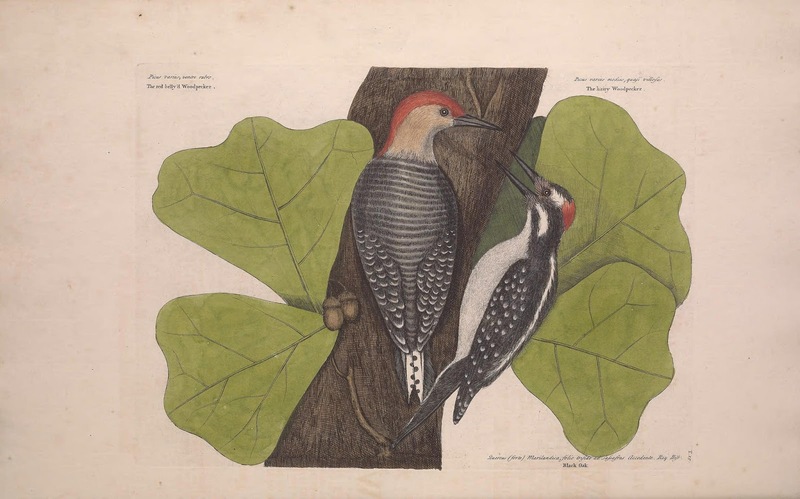 Published over eighteen years between 1729-1747, The Natural History of Carolina, Florida, and the Bahama Islands contains 220 plates based mostly upon Catesby’s own watercolors, which he worked up based on sketches he made in the field. The success of Catesby’s work was based largely on his emphasis on personal observation and use of art to convey a visual record of his research. Over 250 years later, students in South Carolina are following Catesby’s example. As part of a collaboration with the Catesby Commemorative Trust, Dr. Tracey Hunter-Doniger used illustrations from The Natural History of Carolina, Florida, and the Bahama Islands as the foundation for lesson plans designed to help students learn more about the importance of observation and the relationship between art and science. “Before photography, scientists used drawings to record what they saw. Scientists also had to be artists. 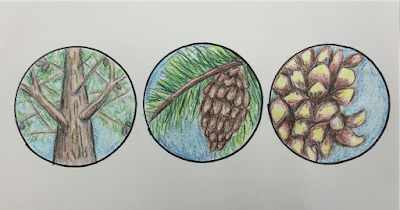 These lessons are an opportunity for students to see how art and science are connected while also understanding the importance of Catesby’s work and his role in natural history,” emphasizes Tracey. Dr. Tracey Hunter-Doniger. Image Credit: College of Charleston website http://teachered.cofc.edu/faculty-staff-listing/hunter-doniger-tracey.php. A fifteen year K-8 visual art education veteran, Tracey has spent the last five years at the College of Charleston as an Assistant Professor of Creativity and Creative Arts in Education. 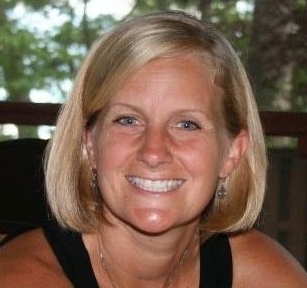 In the fall of 2016, Tracey teamed up with her friend Erin Russell, the art teacher at Memminger Elementary School in Charleston, SC, to implement a trial run of her lesson plans in the 1st, 3rd, and 5th grade art classes at Memminger. All three classes were challenged to use their powers of observation to record what they saw, just as Catesby had done centuries before. Students were given copies of Catesby’s illustrations, which Tracey downloaded and printed from the Biodiversity Heritage Library. The first edition copy of Catesby’s masterpiece in BHL, digitized from the Joseph F. Cullman Rare Book Library at Smithsonian Libraries, is one of the few known perfect copies of this edition in existence. The first grade students were instructed to use the illustrations as a reference to draw their own copy of the specimens. 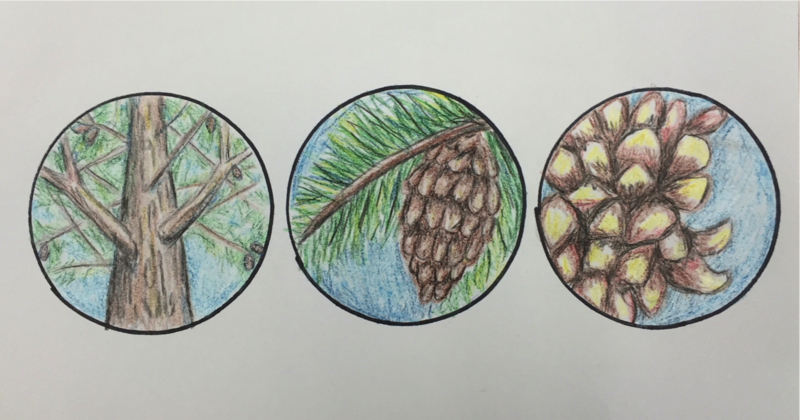 The third and fifth graders were asked to flex their observational skills even further by not only copying the illustration as they saw it, but also homing in on a specific section of the image and creating a more detailed depiction of that area, as though they were looking at it through the lens of a microscope. Example of the 3rd and 5th grade Catesby lesson, whereby students “zoom” in on details in the specimen being observed. Example by Dr. Tracey Hunter-Doniger. While the trial runs of each class were limited to one, 45-minute session, Tracey believes that the lessons helped the students understand how art can be a scientific tool. For future iterations, she hopes to run the classes as three-week lessons where students start by observing and copying Catesby’s art in the classroom and then extend their learning to the outdoors by taking nature walks and drawing in the field, as Catesby did. She would also love the students to have the opportunity to explore Catesby’s publication in full through the BHL website. The lessons that Tracey created are just two of several that are being developed as part of a collaboration with the Catesby Commemorative Trust and the College of Charleston. For example, a science lesson, written by William Veal, Cyndi Hall, and Rodney Moore, uses Catesby’s art to help students assess how adaptations contribute to a species’ ability to survive in a given environment. Lesson activities include drawing a bird inspired by a Catesby illustration, noting characteristics (such as beak shape), and performing experiments to see how various adaptations might help that species survive. The lessons plans resulting from this collaboration are being made available to teachers in South Carolina through the LearningWhy site created by South Carolina ETV. The plans are also available to teachers across the country through PBS LearningMedia. 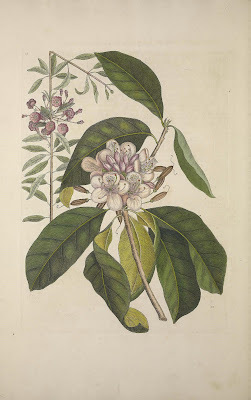 Catesby, Mark. The Natural History of Carolina, Florida, and the Bahama Islands. v. 2, ed. 1, pl. 17. Digitized by Smithsonian Libraries. http://www.biodiversitylibrary.org/page/40680449. From Tracey’s perspective, the use of Catesby’s material in these lesson plans is a powerful way to integrate primary source material that is not only historically significant but also highly relevant to the area where she and her students live. Thanks to the Biodiversity Heritage Library and Smithsonian Libraries, students in South Carolina and others around the world can freely and easily access Catesby’s work and countless other natural history treasures, no matter where their classroom journeys take them. Want to bring Catesby in to your own home? 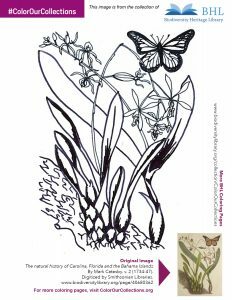 Now you can with the Biodiversity Heritage Library’s coloring pages! Created for the #ColorOurCollections campaign, this new coloring book features three images from Mark Catesby’s The Natural History of Carolina, Florida, and the Bahama Islands. Visit the Biodiversity Heritage Library page to download the full b0oklet. Previous Post Help us discover #WhereDidWonderGo?